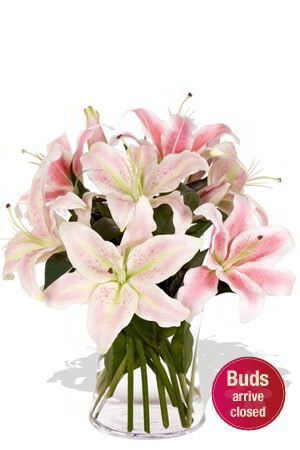 This bouquet of Large Oriental Lilies will stir anyone's emotions with its exhilarating fragrance and generous delicate pink blooms of perfection. 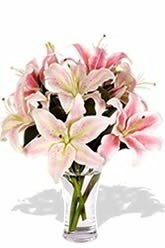 Enjoy the great value of 1 - 2 large blooming heads on each of the 3 stems.Lilies may be sent closed/partially closed in order to prevent damage and to last longer.Vase not included however; we suggest including a Premium Vase with your gift to make the overall impression a little more fancy. Great selection and the ordering process was very easy. I am still not sure that my friend received flowers as he didn't say anything but will find out tonight. Would be helpful for the courier link re delivery could be attached to an order so we could check outcome! Excellent service, quick delivery! Very Happy recipient. Will definitely use your services again! Did not see the flowers but the recipient appears very happy with them. Good service to use and very straightforward. Wonderful way to send flowers to the other side of the world! Superb...website was easy to navigate and place the order and the flowers were delivered on time!